(Memphis) When you think of someone who is locked up, you usually imagine a pretty boring life, cut off from the outside world. WREG-TV found that’s not the case in one Memphis lock-up. 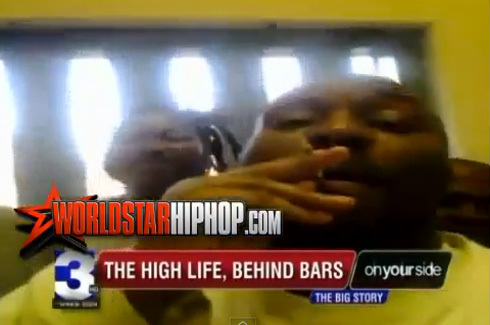 Inmates are openly displaying gang signs, hoarding mounds of food and even smoking marijuana and it’s all happening under the supposedly watchful eyes of prison guards. The inmate is locked up on a six-year sentence for a violation of probation on aggravated burglary and theft convictions. Judging from his Facebook page, he’s doing anything but hard time behind bars. Sneaking in a cell phone inside a penal facility like the Shelby County Corrections Center is a big deal, but what else he has his hands on is almost unbelievable. The inmate then proceeds to show off a huge lot of snacks and commissary items that he and his prison buddies share. The inmate says they are living a better life on the inside of prison than most of us are on the outside. The inmate consistently posts on the website using his illegal cell phone. The latest post was this afternoon. As he kisses a bag of what he says is marijuana and lights one up, he says they need a lot of food because all the smoking they do in prison makes them hungry. There is never any mention of the many prison guards that are supposedly watching them. News Channel 3 brought this Facebook page to the attention of Shelby County Mayor Mark Luttrell’s office. Luttrell said he is aware of the video and the inmate and is investigating.